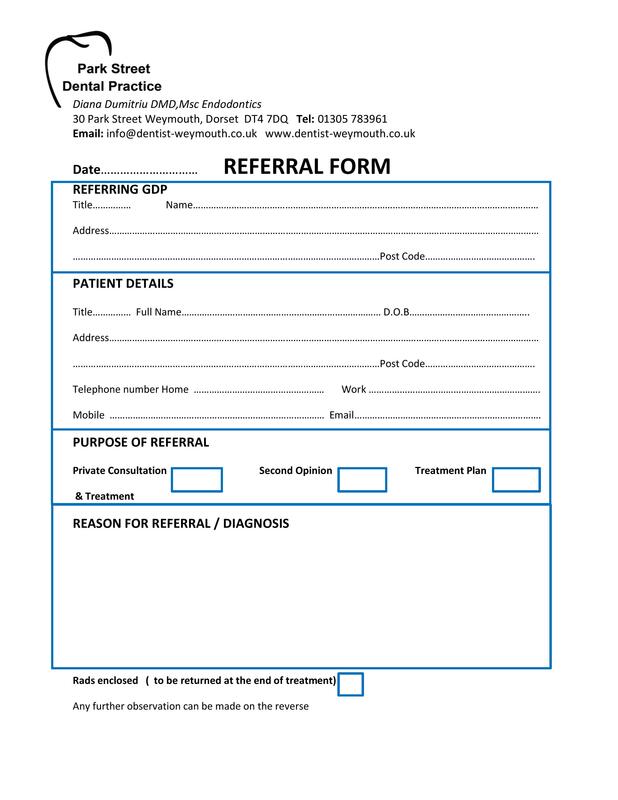 Please download and print the PDF referral form here. Please download and print the JPG IMAGE referral form here. We are proud to announce that the new surgery 2, fully dedicated to endodontics, is now in use. Do you dread endodontic treatment? Why not reffer the difficult cases? Dr Diana Dumitriu has a Master in Endodontics obtained from the University of Warwick in October 2013. She is taking endodontic refferals. Park Street Dental practice is conveniently located in Weymouth town center close to the promenade and the train station. There is ample parking space in front of the practice. The access is easy from Dorchester, Bridport and the surrounding area of south west Dorset. For any additional information you can email at: info@dentist-weymouth.co.uk or call the practice. Please note the case difficulty assesment form at the end of the document. Your signature does not commit you to any treatment. Occasionally, medication will be prescribed by Dr Diana Dumitriu. Medications prescribed for discomfort and/or sedation may cause drowsiness, which can be increased by the use of alcohol or other drugs. We advise that you do not operate a motor vehicle or any hazardous device while taking such medications. In addition, certain medications may cause allergic reactions, such as hives or intestinal discomfort. If any of these problems occur, call the practice immediately. It is the patient's responsibility to report any changes in his/her medical history to your endodontist. I understand the root canal therapy is a procedure that retains a tooth, which may otherwise require extraction. Although root canal therapy has a very high degree of success, results cannot be guaranteed. Occasionally, a tooth, which has had root canal therapy, may require retreatment, surgery, or even extraction. Also during the treatment there is a risk of extruding or swallowing small amounts of a highly irritant disinfecting solution or root canal sealer which may lead most of the times to self-limited complications and only in very isolated cases to long lasting consequences such as persistent numbness or pain of the lip, chin, tongue or maxillary sinusitis. However, the risk is extremely small and all efforts will be put in preventing it. Calcified canals preventing endodontic therapy through the entire length of the root may lead to extended treatment time or the need of additional appointments (which will NOT be charged extra). Following treatment, the tooth may be brittle and subject to fracture. A restoration (filling), crown and/or post and core will be necessary to restore the tooth, and your general dentist will perform these procedures. During endodontic treatment, there is the possibility of instrument separation within the root canals, perforations (extra openings), damage to bridges, existing fillings, crowns or porcelain veneers, missed canals, loss of tooth structure in gaining access to canals, and fractured teeth. Also, there are times when a minor surgical procedure may be indicated or when the tooth may not be amenable to endodontic treatment at all. Other treatment choices include no treatment, a waiting period for more definitive symptoms to develop, or tooth extraction. Risks involved in those choices might include, but are not limited to, pain, infection, swelling, loss of teeth, and infection to other areas. All of my questions have been answered by my endodontist and I fully understand the above statements in this consent form. Furthermore, I give Dr Diana Dumitriu my permission to voice record, tape digitally, videotape and/or take digital photos of my procedure for purposes of completing my medical record and/or for patient education. Note: All medical records will be kept strictly confidential.